We are leading manufacturer and supplier of Fully Automatic Strapping Machine and our product is made up of good quality. These machines are robust, durable, efficient with auto refeed function. The special strap guide system allows for wider range of straps in order to produce the cost. PLC Control/Solid State Relay output system assures the longer useful life. 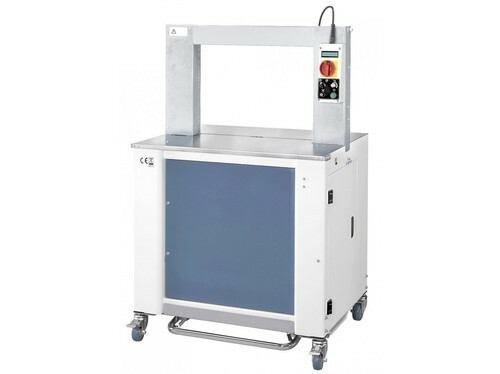 These machines have instant heating, quick and secure strapping. And meant for integration into the production line or stand alone machine. These machines suit for the light product as well large and heavy products etc. Catering to the wide market for pack machines, vacuum packing machines, blister packing machines and industrial packaging machines. We leverage our success on our ability to provide customized products and services to the clients. We have mastered the art of harnessing the latest technologies for the benefit of the company. We provide our customers with vacuum packing machine, blister packing machine, industrial packaging machines, vacuum packaging machines, shrink packaging machines, strapping machines. To ensure that we manufacture flawless machines that are high on accuracy and efficiency, we are equipped with variety of machines. These include CNC lathe machines, CNC cutting machines, shearing machines, welding machines, grinding machines.